After referencing it multiple times over my 4(!) years of blogging, I figured it was time to officially share my go-to cashew “mozzarella” recipe with you. 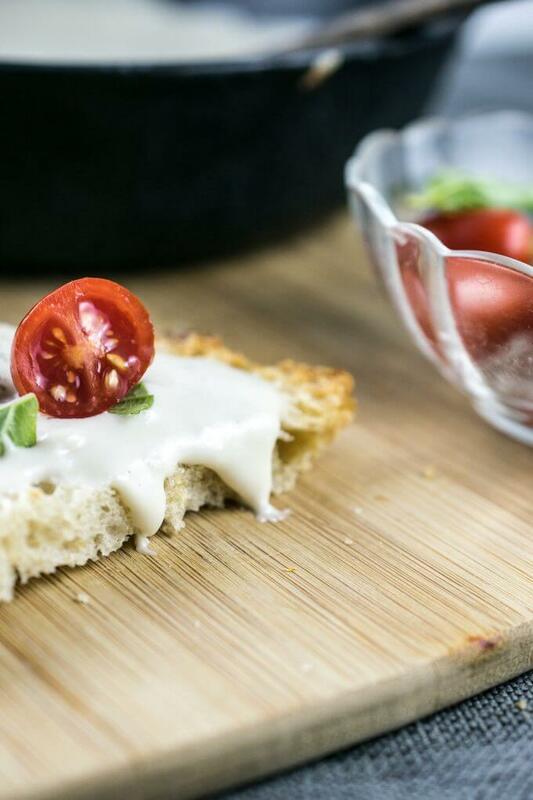 This vegan mozzarella spreads, melts, and has a mild flavor that makes it versatile and omnivore-approved. 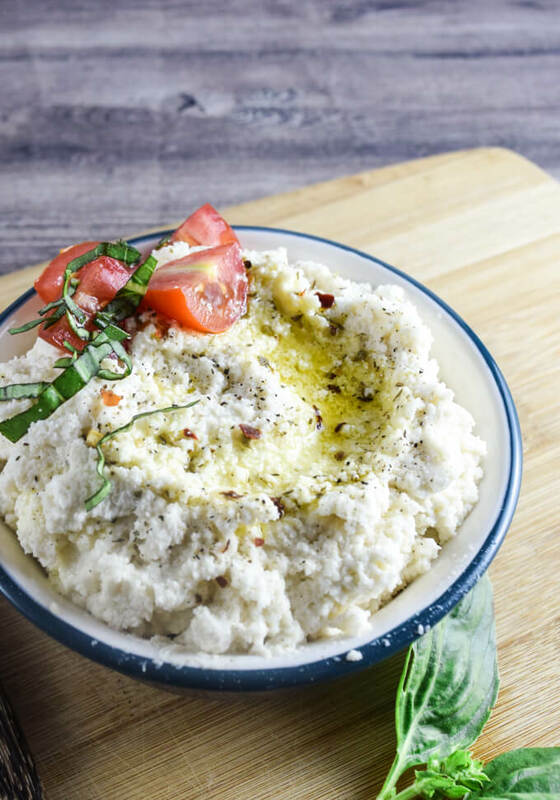 My cashew mozzarella recipe isn’t terribly different from others you’ll find online, but I do use one extra ingredient that I think gives the flavor something other recipes are missing. If you’ve made my almond feta or almond ricotta recipes before, you can probably guess what that ingredient is. Yup, it’s plain non-dairy yogurt! Not all dairy-free yogurts are created equal, so if you can’t find a quality brand that’s unsweetened with fewer additives (I recommend coconut-based dairy-free yogurt like So Delicious or Anita’s), use the lemon juice substitution listed in the recipe notes. I also add a little bit of miso for more umami; check out the notes for how to substitute around that one too. This dairy-free mozzarella isn’t meant to be enjoyed fresh by itself like its dairy counterpart. It works best in heated recipes (in the above picture it is featured in a slice of my vegan lasagna!). Consequently, I’ve never bothered trying to make mozzarella balls with it or shaping it into a mold, which would involve adding a stabilizing ingredient like carrageenan or agar agar. 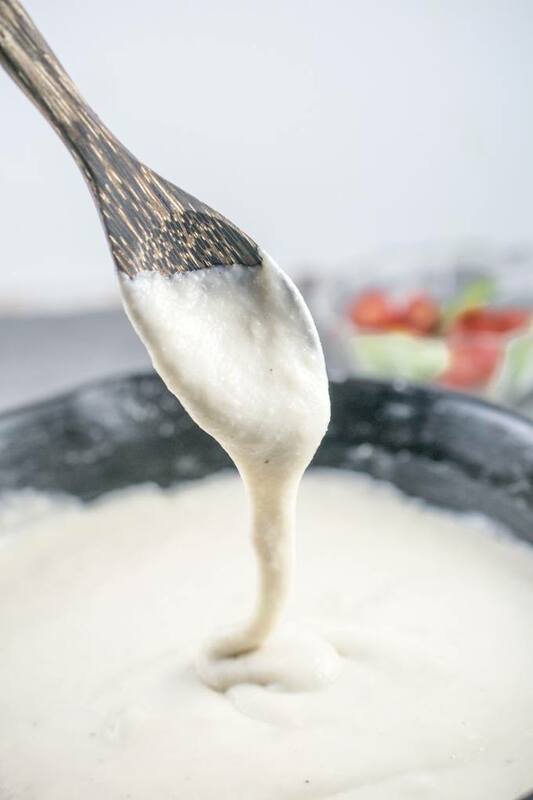 Instead, it’s just tapioca starch that does all of the magic, adding a starchy, stretchy quality to the vegan mozzarella mixture that lets it remain spreadable and melty, but still maintain a little bit of body when heated. Tapioca starch/flour is available at lots of grocery stores these days, especially those that stock other gluten-free baking ingredients. It’s also available online and is not pricey. Made from cassava root, it is naturally vegan and gluten- and grain-free, and paleo too if you’re looking for that. I know I’ll get questions about how to make this nut-free. I’ve been experimenting ad nauseam with cashew-less versions of this based on sunflower seeds, coconut milk, or even weirder things, but I haven’t been successful yet. I’ll be sure to update here if that changes. In this day and age there are some decent vegan mozzarella brands available at your local Whole Foods, but in my opinion the best vegan mozzarella is one that you make right at home, for less money and with complete control over the flavor. Looking for store-bought vegan mozz brand recommendations anyway? Recommended: Miyoko’s Kitchen, PEP Foods, and Vtopian. Not my favorites: Daiya, Trader Joe’s. But that’s just me! I use more cashews and less tapioca starch than the classic vegan mozz recipe floating around the internet. Feel free to play around with the exact proportions here to find the best dairy-free mozzarella for you. 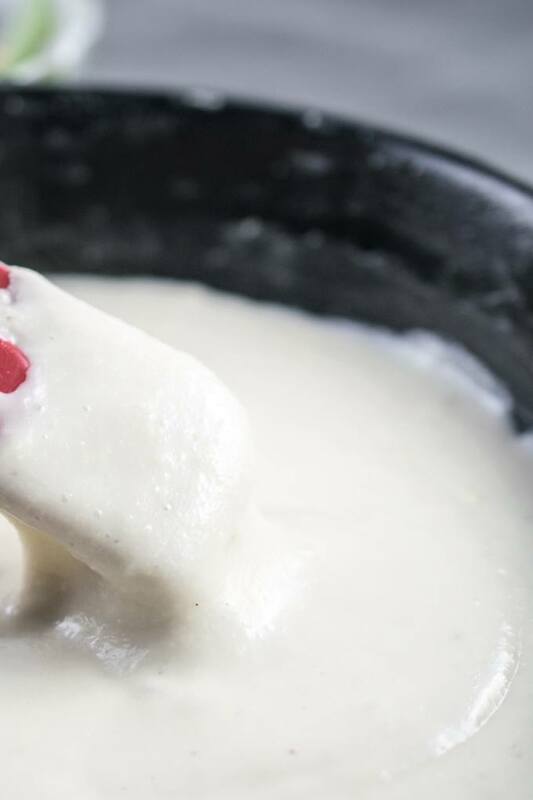 Recipe for classic stretchy and melty vegan mozzarella made from cashews. 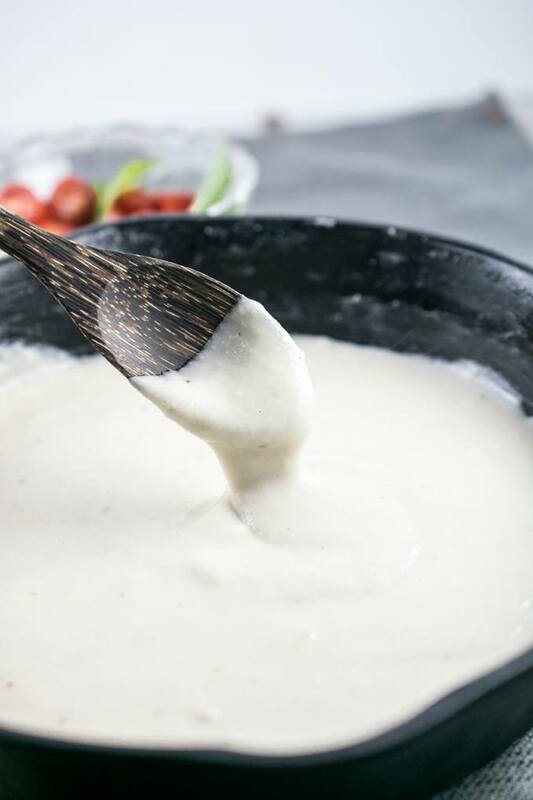 This sauce-style, non-firm dairy-free mozzarella is best in pizza, lasagna, quesadillas and grilled cheese. To prepare for making this cashew mozzarella, soak your raw cashews in hot water for 2-4 hours, or overnight in normal temperature water. Drain the cashews and add them to your blender or food processor. Pulse to break down the cashews into crumbly pieces. Add the tapioca starch, yogurt, miso, salt, and garlic, and blend to combine as best you can, scraping down the sides as needed. Finally, add the hot water and blend until completely smooth. (If using a food processor or a weaker blender, this may be difficult. If desired, you can pass the mixture through a nut milk bag or mesh sieve after blending to ensure smoothness). Transfer the mixture to a saucepan, preferably nonstick. Turn the heat to medium-low. Cook the mixture, stirring frequently but not constantly; and taking care to scrape around the bottom and sides of the pan. After a few minutes, the mixture will start to thicken and look like it is curdling. Continue to cook and stir until the mixture turns into a cohesive, stretchy mass of vegan mozzarella. Once the mixture is smooth, cook for 1 minute more and then remove from the heat. 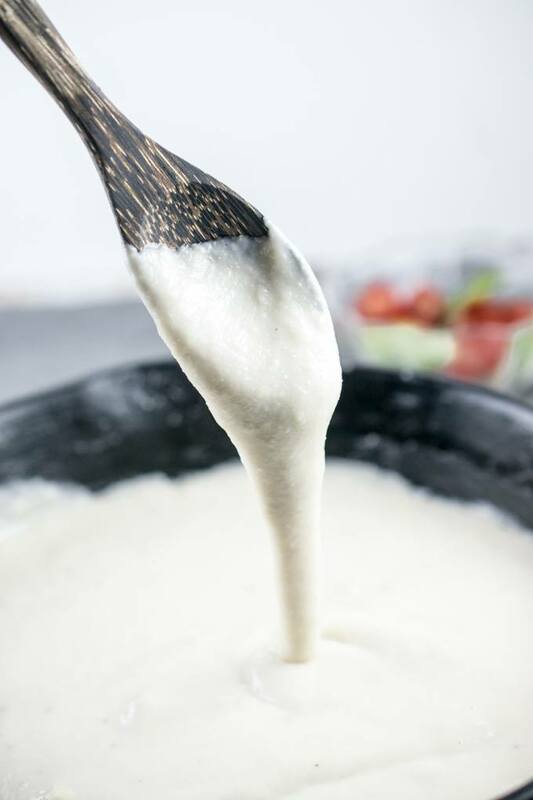 The cashew mozzarella is then ready to be dolloped onto the food of your choosing. After cooling, it can also be kept in the refrigerator for up to approximately 4 days before using. NON-DAIRY YOGURT: If you don't have access to unsweetened non-dairy yogurt (even if you do, if it's only soy yogurt I'd probably recommend avoiding it because it doesn't taste good); you can use lemon juice instead. Substitute 1 and 1/2 teaspoons fresh lemon juice for the yogurt in this recipe, plus more to taste. If you don't have miso, you can substitute it with nutritional yeast; or simply omit it. VARIATIONS: For an orange-ish "cheddar"-y color, add 1/4 tsp paprika to this recipe. CASHEW-FREE: I have successfully made this with macadamia nuts instead of cashews, but have yet to perfect my nut-free versions. USES: This cashew mozzarella can not be molded, grated or shredded. It stays as a blob that can be dolloped onto things. When exposed to high heats it will brown realistically and form a slight outer crust. CASHEW QUANTITY: Recipe updated in December 2017 to reduce the quantity of cashews for a better texture. If you are seeking a slightly richer cheeze then add 1 tablespoon of olive oil or refined coconut oil. The cashew and tapioca-based vegan mozzarella technique was originally (as far as I know) heralded by Somer McCowan of Vedged Out; this is my own version tweaked over time. Many thanks go to Somer for her wonderful contributions to the world of vegan food! Almond Ricotta – only 2 ingredients plus salt! 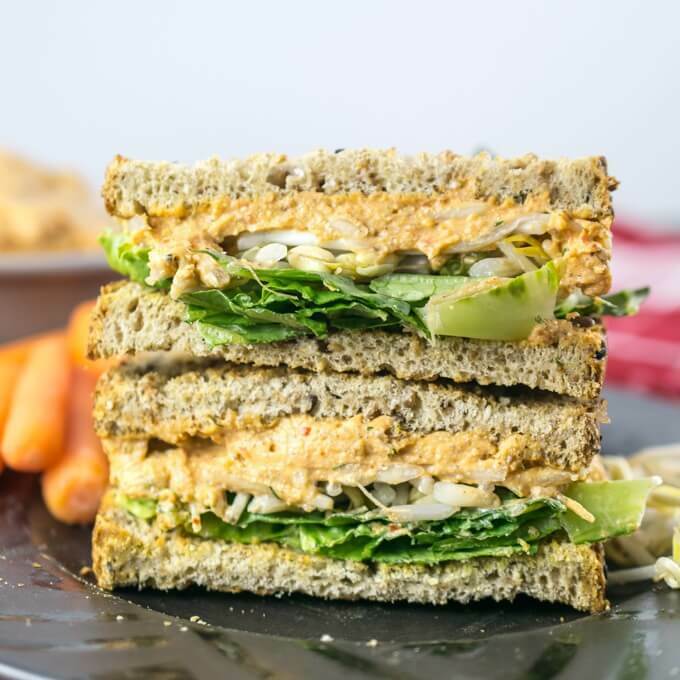 Pimento Cheese-less Spread – perfect for umami lovers! 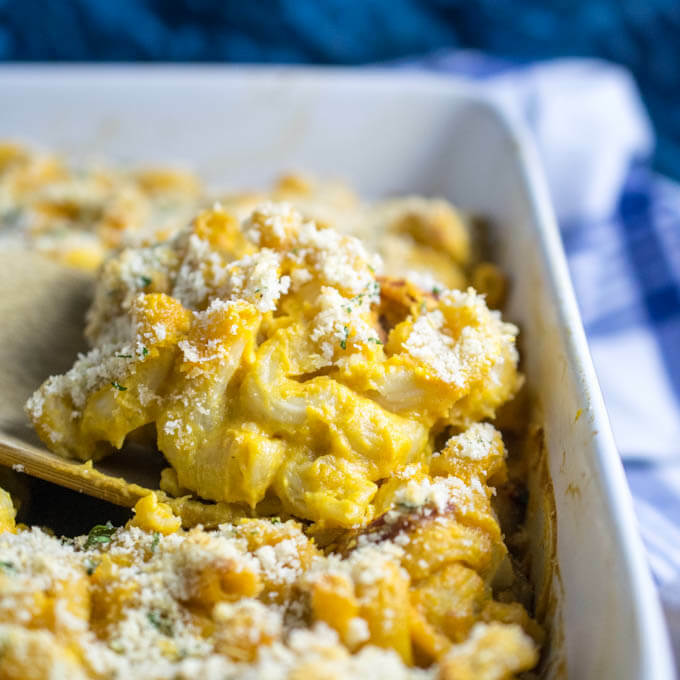 Creamy Vegan Baked Mac and Cheese – made from scratch! This is one of those recipes from your site that makes me feel like I can go completely vegan someday (I’m working on it, trying to make incremental changes). I didn’t think I liked vegan cheese until I tried this cashew mozzarella, seriously. It has the perfect texture and a mild flavor that makes it work well with anything. Thank you thank you! Perfect! 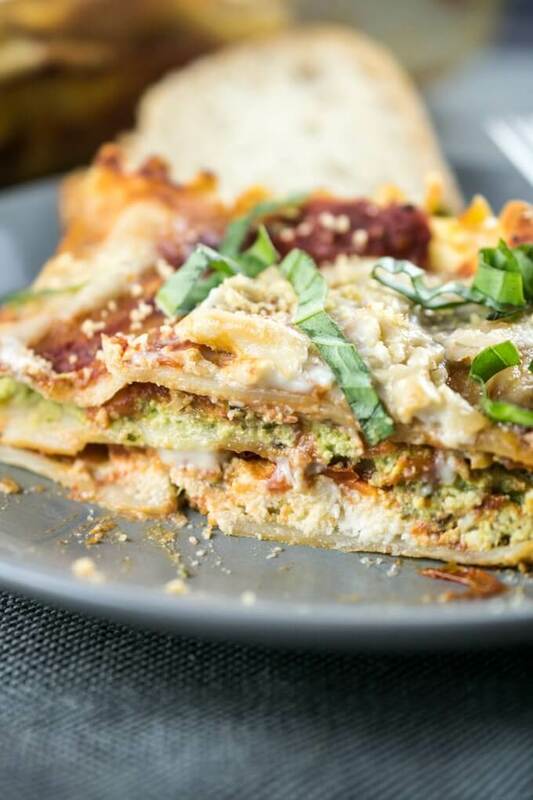 I used this mozzarella for the Ultimate Lasagna and it worked beautifully! Hello, thanks for sharing these recepies. Id like to make give the mozarrella some fermentation with live bacteria. Also, would like to turn them into mozarrella balls and Be able to melt and brown… What do you suggest? Thank you, I will try again soon! I tried to make this and it tastes a bit weird. I used Planters Cashew halves and reduced the amount of salt I added. I’m not sure the difference between raw cashews and Planters. Would that have made a difference? I also soaked them for only 15 minutes. I used lemon juice & nutritional yeast. I tripled the recipe but only used 3 garlic cloves which was still too much. I used the mixture to make the brussel sprouts gratin recipe. I feel bad because it’s not very good and I’ll probably throw most of it out. Any thoughts for next time? Thanks for your comment. Roasted cashews produce a very different result than raw cashews. Raw cashews have a neutral flavor and a soft, starchy texture whereas roasted cashews have a strong cashew flavor that does not balance well with the other milder flavors in the recipe. So following the instruction to use raw cashews is pretty important. I’m very sorry that you had a negative experience. When I was first getting into vegan cooking I made the same substitution a couple of times too & also learned the hard way. Just to mention raw cashews are a nearly unobtainable item due to they’re allergy inducing poisonous liquid coating. They have to be cooked in some way shape or form before packaging. I have found steamed cashews though those were quite nice, i believe they were labeled as raw. May i ask what brand and where you obtain them? Used for quesadillas. Tasty and worked very well. I’ve tried a similar recipe before with lower content of cashews. I think this one was a bit richer and more realistic.